A hard-working display from Stoke sees them secure a first win under new boss Nathan Jones. 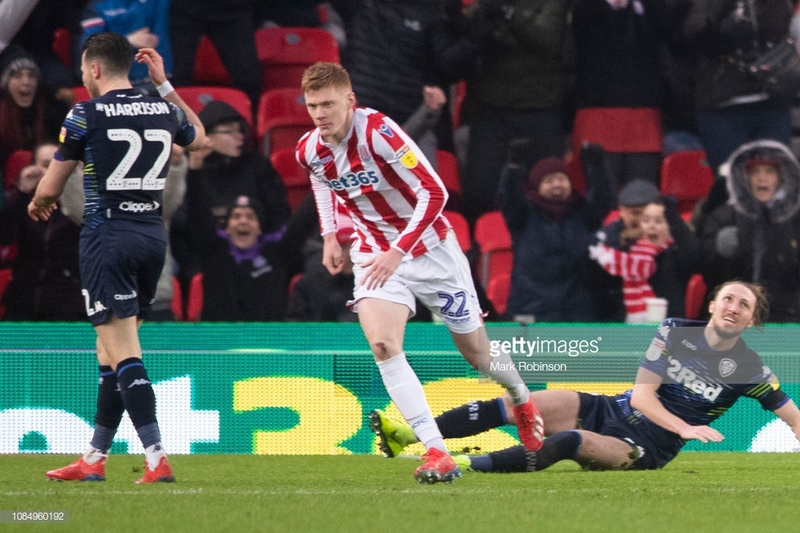 Marcelo Bielsa and Leeds United suffered a hangover from ‘Spygate’ as they succumbed to a 2-1 loss away at Stoke City at the Bet365 Stadium. The Potters were full worth for their victory, demonstrating the hunger and commitment that boss Nathan Jones has demanded since his appointment last week. An entertaining start yielded chances for both sides that could not be taken. Pablo Hernandez scuffed harmlessly wide when set up following some good play down the right-hand side for the visitors, whilst striker Tyrese Campbell - on his first league start for Stoke - failed to connect on the volley when presented with a knock-down from a deep free-kick. It was Bailey Peacock-Farrell who was the busier of the two goalkeepers as the half wore on, however, as the home side looked to impress in manager Nathan Jones’ first home league match. A Peter Etebo free-kick from 25 yards out had to be spectacularly tipped round the post, whilst the young stopper also was also alert to keep out a fierce Joe Allen half volley from the edge of the box. Bielsa’s men rode the wave and looked to try and assert their authority, winning a number of set pieces that they ultimately failed to make count. Their clearest opening fell the way of Pontus Jansson, but he could not connect to an inswinging Hernandez free-kick having found space at the back post, to ensure the sides went in level at the break. The hosts started the second half with the same vigour and drive they had demonstrated in the first. It was clearly a refreshing change for the home supporters from recent times, with every chased ball, intercepted pass and lung-busting run roared as if a goal had been scored. Some fine work by Moritz Bauer saw the right back cross the ball in from the touchline, and his delivery was not dealt with by the Whites’ backline. A bout of weak head tennis culminated in a tepid headed clearance from Mateusz Klich falling straight to the feet of Sam Clucas fifteen yards out. The wing-back’s driven left-footed effort was too precise for Peacock-Farrell, and it nestled in the corner of the net to send the home fans into delirium. Jones’ men were relentless in their pressing and haranguing high up the pitch, and it was this pressure which saw the away side reduced to ten men. A ball over the top saw a foot race between Afobe and Jansson, and it was the former who came out on top. He bore down on goal yet was impeded by the defender, and despite getting his shot away referee Gavin Ward deemed the contact too extreme and issued the Swede with his second yellow card of the afternoon. As the clock ticked towards 90 minutes the visitors probed for an equaliser to extend their lead at the top of the table. They thought they had found just that in the 83rd minute, as Luke Ayling bulleted a header towards goal from a corner. The United fans thought it was their moment, however, a sublime one-handed save from one-time Leeds loanee Jack Butland somehow clawed the ball off then line - and how crucial that stop proved. Just moments later substitute James McLean drove down the left wing and flashed back a ball across the six-yard box. The cross was met by the onrushing Joe Allen, who slid home the ball at the back post to put his side two-nil up. A 94th-minute Ezgjan Alioski goal, struck low from the corner of the box following a partially cleared corner, was not enough to spoil the party as City move up to 14th. Leeds meanwhile remain top, but only by one point from the chasing Norwich City.